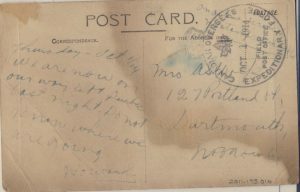 On this day in 1914, Dartmouth native and journalist, Howard Cormack Wolfe sent this postcard to his mother to tell her that his battalion had departed Quebec City for Europe. Howard was part of the Canadian Expeditionary Forces’ 8th Battalion that was organized at Valcartier, Quebec. 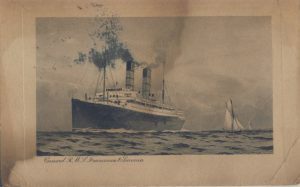 While Howard did not know where the Franconia was headed, we now know it was destined for Plymouth, England after changing course from Southampton due to U-boats. Howard fought in the Second Battle of Ypres (22 April – 25 May, 1915) and it was during one the engagements the Battle of St. Julien on May 5, 1915 that he was declared missing. On June 28, it was suspected he was a prisoner of war (POW) and was being detained at a camp in Münster, Germany. Although, he was not officially declared a Prisoner of War until August 20, 1915 and was determined to be in Gütersloh, Germany. 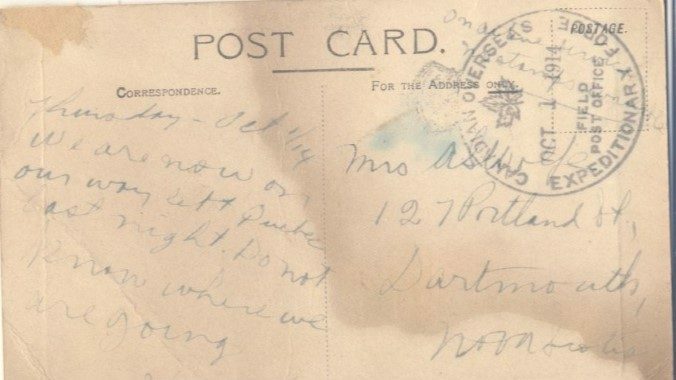 According to his First World War Personnel Record, which you can view here, he was not released as a POW until 1918 when he was interned in Holland. He was discharged in Halifax on March 3, 1919 and was returned home to live with his parents, Andrew and Jessie, at 127 Portland Street in Dartmouth.